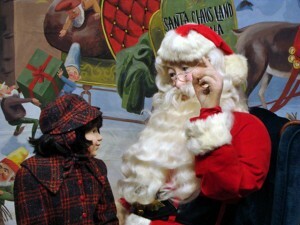 UPDATE-Dec. 22, 2011: Santa’s Elves Workshop is now closed for the season. We wish you and your family a very Merry Christmas and Happy New Year. As always, we look forward to your visit in 2012! Please feel free to stop by and see the newly restored Historic 1935 Santa Statue. For directions to our new location, please click the link to go to our Plan A Visit page. We’re pleased to announce the opening of a new location where children and their families can write and send their letters to Santa. Beginning Thanksgiving weekend through December 18, 2011, Santa’s Elves will open their workshop to the public at the Historic Santa Statue. Inside, children can take a seat at an antique school desk and draft their wishlist to the jolly ‘ol elf. Families will also be able to experience a portion of the Santa Claus Museum’s collection showcasing the history of our town, area attractions and even see what children of yesteryear might have found beneath their Christmas trees. You can also take a short walking path up to the newly restored Historic Santa Statue, dedicated to the children of the world. So glad to see that Santa's Elves is opening with the museum,I was worried people would miss out on the history of Santa Claus> Will this be a permanet location for the museum? Lynn, thank you for your support! We do have some big plans we're working on for this location and do believe we're going to stay awhile. Stay tuned for the updates we hope to announce shortly! I believe that I have a piece of history from the Santa Claus Land that is dated back in the early 1960s. This is a small mirror case that has a mirror in it that my mom had in her ceddar chest. In her pasting I decided to go through this and this is one thing that I found. I remember going to Santa Claus land in the 1960s as a child. Can y help me with this and tell me where I need to send this piece of item to help with the history of Santa Clause Land.